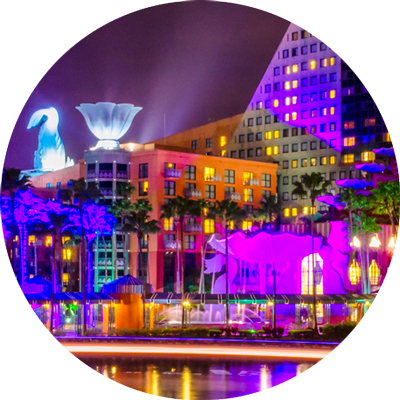 Join us at the Walt Disney World Swan and Dolphin Resort Hotel – located in Orlando, Florida – for the OLC Accelerate 2018 event. Find special hotel rates, travel tips, directions and more on this page. Pre-purchased tickets must be picked up during your conference registration check-in. For conference attendees who have purchased optional item tickets (awards lunch, Disney tickets), there will be no refunds and no exchanges within 2 weeks of conference start date (October 30). Onsite, available tickets may be purchased at the OLC Disney table in the conference registration area. For the Thursday evening Disney Twilight (After 5pm) tickets, online sales through OLC suspend after Nov 6. OLC will not sell any after Twilight (After 5pm) Disney tickets between Nov 7-11. Beginning Nov 12, ticket purchases may be made onsite (as available) during conference registration desk hours. For Thursday evening Mickey’s Very Merry Christmas Party, tickets are now sold out as of 11/6/18. Tickets may still be available directly through Disney. There will be NO onsite sale of MVMCP ticket, but #OLCTIXSWAP may be used to buy, sell, or trade with other attendees. Starting Oct 30, OLC will not issue any ticket refunds or exchanges. Anyone wishing to sell their ticket may do so with a fellow attendee using #OLCTIXSWAP. Located in the heart of the most magical place on earth, the Walt Disney World Swan and Dolphin Resort provides a truly extraordinary backdrop for your Orlando vacation or conference experience. Special conference room rate of $215.00 + $15 mandatory resort fee* + taxes. The special conference hotel rate has been extended and is still available for nights with availability. The hotel is currently sold out for the nights of Tuesday 11/13, Wednesday 11/14, and Thursday, 11/15. The hotel will keep a waiting list. Option 2: Call Swan/Dolphin Reservations 800-227-1500 or 888-828-8850.
and let them know you are with the Online Learning Consortium group. Note: Swan/Dolphin reservations are open Mon-Fri 7am-11pm ET or Sat-Sun 7am-7pm ET. We recommend that you do not call outside of these hours. If you do, your call automatically rolls over to Marriott central reservations, and they do not have the group information available. Please call within the hours indicated above to get the best OLC group rate. The special conference rate also applies for three days prior to and three days after the conclusion of the conference. High-speed internet access is included in your room at the Walt Disney World Swan and Dolphin as part of the room charge. Complimentary wireless network access will be provided by OLC in the conference area. Connection instructions will be available when you pick up your name badge at the conference registration desk. *Mandatory Resort Fee includes: daily replenished bottled water, internet access, access to the fitness center, local calls. The resort does not provide an airport shuttle or transportation. Your best options for transportation between the airport and the resort are to arrange for a shuttle (Mears Transportation, SuperShuttle, or Orlando Airport Van) or for a car or taxi cab. Additional information and coupons for shuttles will be posted as they become available. Mears Transportation provides a discount coupon ($4 off regular round trip price) for round trip shuttle service to OLC Accelerate attendees. Advance reservations can be made online, or you can provide a copy of the coupon (pdf) when you arrive to make an on-site reservation at the Mears desk at the airport (MCO). **To receive the discount, attendees must either purchase their ticket online using the provided link or present a physical coupon at the Mears Counter at the Orlando International Airport. Having the coupon on a mobile device will not be accepted. OLC Accelerate attendees staying at the Swan and Dolphin are entitled to complimentary self parking. During the check in process, our front desk agents will ask guests if they parked a car and will remove the parking charge. Tickets for Thursday evening at Disney are now online available to purchase onsite. Sold out as of 11/6/18. Tickets may still be available directly through Disney or you can search for #OLCTIXSWAP to buy, sell, or trade with other conference attendees. Tickets are available in very limited quantities, and we will fill orders as long as we can still get them from Disney. Ticket price (Mickey’s Very Merry Christmas Party): $86 if ordered through OLC (no tax); $101.18 if ordered through WDW (with tax). Ticket orders taken through November 6, 2018; after November 6, tickets may be purchased onsite at the conference registration desk. 4:45pm – 8:00pm access; Warning on the earlier close time for this park: Certainly there are noteworthy rides at this park – the new Pandora, Mt. Everest, the Jungle Safari, Dinosaur, etc. – but you will have a limited number of hours at this park to partake in rides. You can definitely get some of it in, but not all of it in 3 hours. The new River of Lights closing laser light show on the river is spectacular, and will occur at 6:30pm on this evening. The park closes at 8:00pm. If you are planning on staying additional days in Orlando, you might want to select this park for a different day where you can spend more time there. Note: For both EPCOT and Hollywood Studios, we recommend walking the 10-15 minutes to the park, and then riding the Friendship boat back to the hotel (if desired). Riding the boat TO the park can mean long delays getting there. Attendees deciding to go to Magic Kingdom or Animal Kingdom will catch the Disney shuttle bus outside and left of the Dolphin Lobby entrance. Tickets ordered through OLC for Thursday evening are picked up during your conference registration check-in. Tickets ordered directly through Disney for other days are picked-up at the Disney guest relations desk at the Dolphin. After 5pm ticket purchases through OLC will be suspended on November 6 and will be begin again onsite on Tuesday, November 13. Thursday evening tickets for Magic Kingdom (Mickey’s Very Merry Christmas Party) are only available for sale in advance during conference registration. Tickets are available in very limited quantities, and we will fill orders as long as we can still get them from Disney. There will be no sales after our early bird registration deadline or onsite sales of these special high-demand tickets. Tickets through OLC are ordered and paid for through your conference registration. Tickets ordered through OLC are tax-exempt. Tickets ordered and paid for directly through Disney (see the ‘Additional Disney ticket options’ link below) for November 15 or any other dates during your stay in Orlando will be charged sales-tax by Disney. Tickets ordered directly through Disney must be ordered no later than 5pm November 12, 2018. 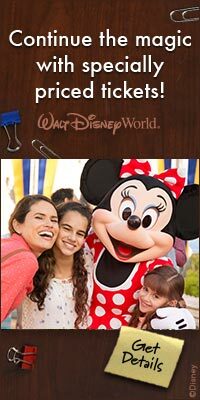 You cannot purchase conference-discounted Disney tickets from Disney after 5pm November 13, 2018. Tickets through OLC may be paid with a personal credit card even if you paid for your conference registration with your corporate card. If you need assistance to do this, contact conference@onlinelearning-c.org. Please note: park close times can change, but this is the current schedule from Disney. Spending extra time in Orlando and bringing family? Get discounted Disney tickets for your conference stay. Orlando is packed with theme parks. Walt Disney World’s Magic Kingdom, EPCOT, Hollywood Studios, and Animal Kingdom parks, Seaworld, Universal Studios, Islands of Adventure – and the list continues. Special Disney theme park ticket prices are available for conference attendees. Special after 3pm tickets are available for conference attendees and their families. The ticket prices listed reflect any applicable discounts and include tax. Since the Meeting & Convention partial-day and multi-day tickets are not available for purchase at Disney Theme Park Ticket Windows, attendees will need to purchase them through the custom Disney website or in advance through the Disney Ticket Reservation Center at 407-566-5600. All of the Meeting & Convention tickets include FastPasses (details on how to pre-select FastPasses can be found on the custom Disney site). Interested in attending Mickey’s Very Merry Christmas Party while you are in Orlando? Tickets may be purchased directly through Disney, while supplies last. There is a lot to do in and around the Swan and Dophin Resort. Here are a few ideas and links to get you started. Extending your stay or bringing your family? There is a lot to explore that isn’t a theme park! Central Florida is home to hundreds of lakes. Explore nature whether it’s an airboat ride, a challenging standup paddleboard class or kayaking on crystal-clear springs. Ride a zipline through trees, or go see manatees in the wild. Nearby Shingle Creek is the source of the Everglades, feeding into the Kissimmee River system where it feeds into the Everglades in South Florida. Here are a few suggestions (referenced from wheretraveler.com). Explore more possibilities online! Best Hikes in Orlando – Florida Hikes! OLC does not endorse any of these activities or companies – this is only a partial list of possible activities and adventures in the Orlando area. OLC is not responsible for any participation in these activities. Discover a shopper’s paradise at nearby shopping malls and shopping areas. The Walt Disney World Swan and Dolphin offers 17 different dining options onsite. Please visit their dining website for additional information about their many diverse restaurant and lounge options. A brand new “grab and go” eatery, Fuel, will be opening this summer in the lobby of the Dolphin. GardenGrocer.com delivers groceries to your hotel with discounts available for ordering in advance. Check out their service, offering over 5,000 products. An economical and convenient option when traveling!